School Loop supports Easy Grade Pro version 4.0 and 4.1 and the most current version of Making the Grade. Use of these programs offers all the bells and whistles possible with a desktop application while also affording teachers the full benefits of School Loop. Obtaining properly licensed copies of these programs is the responsibility of the school and/or teacher. 1. Click the Settings link (gear icon) located in the main navigation bar. 2. Click the "Choose an alternate Gradebook" link on the right side under Gradebook Settings. 3. Select a gradebook from the pull down menu. 4. Click the orange Submit button. Q: Once I pick a gradebook, can I change it? A: You may switch back and forth between our gradebook and the partner gradebooks. We do recommend, however, that you commit to a gradebook before you've entered any grades. Switching gradebooks after entering grades will require that you reenter those grades. 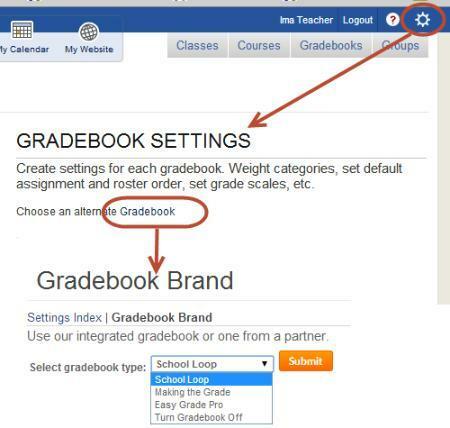 Q: Why don't I see the partner gradebooks in the dropdown list? A: If one or both partner gradebooks are not available, they may not be supported by your school. Ask your school administration if they support the use of the partner gradebook, and have them contact School Loop if they wish to turn on this feature. Q: How will the School Loop gradebook look after I select a partner gradebook? A: If you do select one of our partner gradebooks, all traces of our gradebook will be hidden and the default gradebooks listed under the Gradebook For... menu will be replaced with Partner Gradebook. Q: Is there more information available about the specific partner gradebooks? A: Yes - For more information, use the links in the left navigation of this help page to learn more about integrating these partner gradebooks with School Loop.